Eyebrow tinting is one of the beauty trends guaranteed to make your brows look fuller even without makeup. If you have sparse brows, dyeing your eyebrows a few shades darker works wonder for a fuller, cleaner look. You can also match your hair color to your brows. But this seemingly “quick and easy” beauty trend can do more harm than good, not only for your eyebrows but for your skin and eye health. It poses a bigger threat if you buy “kits” and do it yourself or entrust your beauty and safety to the cheapest salon you can find. Want to know the scary truths behind eyebrow tinting? Here are 5 of them. 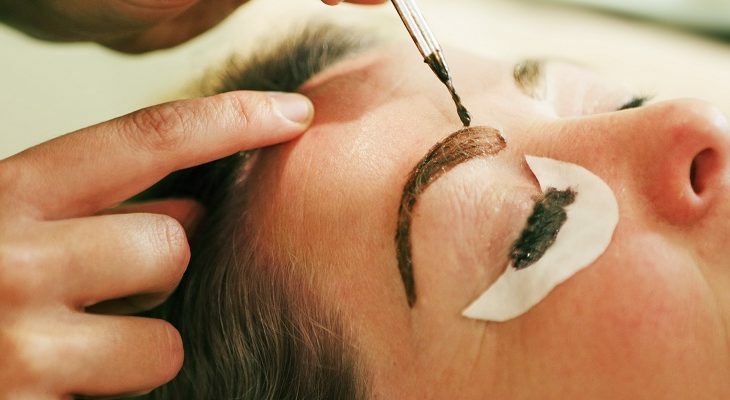 Dyeing your brows is not approved by the Food and Drug Administration (FDA), no matter what kind of dye is used. Whether it’s a seemingly “safe and natural” vegetable dye or coal-tar dyes, none have been deemed safe by the FDA. The preservatives and unjustified ingredients used in the dyes pose the risk for infections. In fact, there’s no standard for what should be used for tinting, which means each salon has its own formulation. According to the FDA, permanent eyebrow and eyelash tints have been known for causing serious eye injuries. We’re not only talking about the possibility of getting dye in your eyes. If you get the harsh chemicals on your sensitive eye area, you might experience either extremely dry or overly watery eyes, redness, itchiness, and puffiness, and painful burning sensation. Coloring your brow hairs means you’re also dyeing the skin underneath. If the dye you used contains harsh ingredients, you’re at high risk of inflaming and infecting your delicate skin. You’ll feel your skin burning, reddening, itching, and puffing. Eyebrow hairs and eyelashes start to fall off too. If you have dyed your hair before, you’re familiar with the itchy, burning sensation on your head, which you believe is “normal.” So now just imagine that getting the dye on the skin of your eyelid, which is the thinnest and most delicate on the whole body. It’s not impossible you have an allergic reaction to the ingredients used in tints. Many cases of “eyebrow tinting gone wrong” is due to allergic reaction. There’s one case of a teen who suffered severe allergic reactions since she had no idea she was allergic to paraphenylenediamine (PPD), a chemical found in dyes. The result? Burned skin, swollen eyes and face, blisters, and burning eyes with puss and tears, which almost led to her blindness. It’s a must to do a patch test 24 hours before the procedure to see. Apply a small patch of tint to the skin on your arm or neck, and leave it overnight. If your skin breaks out, rashes or hives, burns or becomes itchy, then there’s no way you’re letting the product get near your eyes. You better stick to temporary makeup, like brow gels. Whenever you put chemicals near your eyes, like harsh chemicals found in many eyebrow dyes, you are putting yourself susceptible to blindness. It’s not just about accidentally poking your eyes with fingers filled with dye – getting those chemicals on your delicate eye area can increase the chance of getting a painful infection. Next, to the eye infection symptoms, you’re at risk of permanently damaging your eyes and impairing your vision if you leave the problem unaddressed. Even with the warnings of beauty experts and FDA, individuals with beautifully tinted eyebrows, swearing DIY eyebrow tinting works like magic, continue to take over Instagram and Pinterest. However, it’s better to be safe than sorry. Never ever try this at home. If you want to “tint” your eyebrows the legal and safe way, have it done professionally. Look for credible, topnotch brow and lash salons run by experts. They have safe products and know how to apply it properly. Opt for “semi-permanent” tint. Under no circumstances should you go for permanent tint. Don’t fall for cheap salons that don’t even bother to ask about your allergy history. When in doubt, skip the salons and just stick to eyebrow makeup. Products including brow mascara, pomade, and pencil help fill in your brows without posing a threat. Author Bio: Mina Natividad is a resident writer for BrowCo Eyelash Extensions & Eyebrow Shaping, a top of the line brow and lash bar in Australia, which prides itself in delivering professional eyebrow shaping and eyelash extension services. She loves writing articles about women’s health and beauty.